This week?s journey of adventure in bad Apple coverage takes us from the lofty pages of The New York Times and The Wall Street Journal down to the gutter of Gizmodo, which lovingly opens its virtual arms to an angry screed by Newsweek?s Dan Lyons. Technology coverage is not pretty, dear readers. You?d think that if Steve Jobs called you ?a slime bucket? for talking out of school about his cancer that you might have the good taste to not presume to lecture on how Apple would be doing if Jobs were still alive. Well, then you?re not Joe Nocera! Writing for The New York Times, Nocera asks ?Has Apple peaked?? (tip o? the antlers to pretty much everyone). Wasn?t the Macalope just complaining about people not doing the required reading? Come on, New York Times! We thought that time you don?t spend putting a comics section together was devoted to editing and research and being respectable! Now we have no idea what you?re doing. If Steve Jobs were still alive, would the new map application on the iPhone 5 be such an unmitigated disaster? Interesting question, isn?t it? No! It?s not! If only because it?s been asked by every Apple-hating rube who can string two sentences together for the last 12 months. Steve Jobs?s death is just another in a continuing series of imaginary brass rings on the merry-go-round of Apple doom. But more importantly, it?s an asinine question. As Apple?s chief executive, Jobs was a perfectionist. He had no tolerance for corner-cutting or mediocre products. The last time Apple released a truly substandard product?MobileMe? Whoa, whoa, whoa, stop right there. MobileMe. Which was released under ? who? Yeah, right. ?Steve Jobs never would have released a product as shoddy as this product released under Steve Jobs!? No one read that at the Times and thought ?Wait a minute ??? Arrgh. No doubt, the iPhone 5, which went on sale on Friday, will be another hit. Yes! And the Maps issue will fade with time like Antennagate, Glassgate, HandicappedParkingSpotGate, and JobsWithAMustacheGate. So, to answer your question again, no, this is not an interesting question. Apple?s halo remains powerful. But there is nothing about it that is especially innovative. Sadly, it has become a cliche to say one is typing slowly so the slower students can understand, but the Macalope hopes Nocera will take the time to read this next part slowly and digest it. Apple reinvented the personal computer with the Mac, it reinvented the music player with the iPod, and it reinvented the cell phone with the iPhone. It did all that over the last 28 years. To expect the company to come out with another product as ground-breaking as those in the year since Jobs died is simply absurd. You can argue that the iPad should be included, but the Macalope doesn?t put it in quite the same pantheon of products. As pundits at the time of its release were so fond of pointing out, ?It?s just a big iPod touch.? 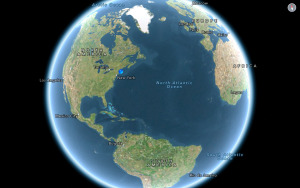 In rolling out a new operating system for the iPhone 5, Apple replaced Google?s map application?the mapping gold standard?with its own, vastly inferior, application? Vastly inferior at some things?albeit very important things?and better at others. ?which has infuriated its customers. With maps now such a critical feature of smartphones, it seems to be an inexplicable mistake. If you find it inexplicable then you?re either not paying attention or being willfully obtuse. Don?t know if you?ve noticed, but Apple and Google aren?t exactly on the best of terms these days. Sitting down to a negotiation over mapping data right now would take someone with the patience of Job, something Jobs with an ?s? certainly did not have. And maybe that?s all it is?a mistake, soon to be fixed. But it is just as likely to turn out to be the canary in the coal mine. Once again the Pundit Ouija Board is pressed into action! Not surprisingly, the board has well-worn grooves leading to the ?APPLE DOOMED!? answer. How long do you think it takes to come up with a new maps app, from soup to nuts? The Macalope doesn?t really know, but he wouldn?t be surprised to hear that it takes more than a year, particularly if you?re starting without any data. The point is, Jobs probably not only knew they were going to do this, he was probably a proponent of it. Apple?s current executive team is no doubt trying to maintain the same demanding, innovative culture, but it?s just not the same without the man himself looking over everybody?s shoulder. Uh, yeah, but the real problem with the app as it stands isn?t so much the part that Apple built as it is the data. Jobs may have been a very intimidating presence standing over your shoulder and slowly strangling a kitten, or whatever pundits like to fantasize about, but he could not magically make map data appear from thin air.